Jimdo's app is free and you can create a free website on a Jimdo sub-domain, buy the Pro package for $90 a year or Business for $240. However, it wouldn't be fair to say that the packages below apply fully to Jimdo Creator iOS app as only a subset of the features are accessible via the app. Many are only available in Jimdo for computers. Creating an account on Jimdo is very easy. Just enter your email address and a password. You can also register with a Facebook or Google account. You can then log in, select a template and set a mysite.jimdofree.com address for your website, if you use the free version of Jimdo, or .jimdoa domain of your choice if you buy one of the packages. 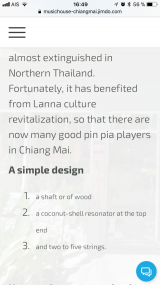 Mobile versions of the templates all look similar but this is a fairly common trend for mobile websites as uniqueness is sacrificed in the name of speed and clarity. The app is easy to use and basically but not entirely WYSIWYG (what you see is what you get). It's also fairly speedy. To add content or make changes, you have to open the top-right menu. In an upgrade from previous versions of Jimdo for iOS you can now edit in portrait and horizontal modes. In the Pages tab, you can add, move or delete pieces of content of the current page. (When done, don't forget hit the ✓ icon to apply your changes.) 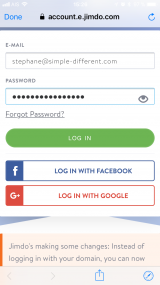 You can see your website as it will look on mobile screens and on computer screens by using the preview switcher button on the bottom toolbar. Jimdo Creator app for iPad is a zoomed-in version of Jimdo for iPhone. No extra capabilities are on offer and if anything it is more difficult to use than the iPhone app because the formatting has been designed for iPhone and adapted later. What Jimdo's iOS app can do it does well. In a major upgrade from earlier versions of Jimdo you can now create and edit sidebars, from within the website menu. This means that you can create and edit multi-column pages and also means that Jimdo has finally made the app more compatible with the themes. When we made our initial review of the Jimdo iOS app 5 years ago Jimdo had promised on their website to add more features. Since then they have added a several, but much of the full functionality of Jimdo is still available only on computers. See more on this below. - Raw content (e.g. 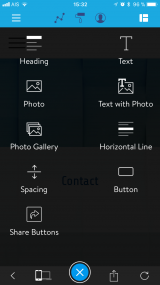 text, images...) in the center of the screen which can be tapped and edited. This hierarchy really helps when organizing ideas into a multi-page website. There's also a quick additional way to add content to the current page via the + button at the bottom. When working with Jimdo you continuously see an editable preview of your website, which gives a good sense of the progress of your work. Unexpected forced log out (on average once every hour). Open the video in the YouTube app, take a screenshot and get the link of the video. Then, go back to Jimdo and add a Photo element. Insert the screenshot of the video, then add the link to the picture so that the video will play when visitors tap on the screenshot. When adding a link, make sure that you select at most 1 line of text, as links cannot be put on multi-line chunks of text. Also, the only way to remove a link is to delete the underlying text and enter it again. You can be logged out unexpectedly while editing! The content capabilities vary between packages, from 500Mb of storage for JimdoFree up to unlimited for JimdoBusiness. I created 30 pages before I tired of testing the practical limits of 500Mb. Jimdo has been around for quite some time as a desktop browser based website builder, and is rated quite highly by many reviewers on that platform. I haven't tested Jimdo for desktop beyond a very cursory look, but it's capabilities seem quite strong. The iOS app offers only a selection of these features. Some types of content cannot be created from within the iOS app, and other types of content, which have been created in Jimdo desktop, cannot be edited in the app. 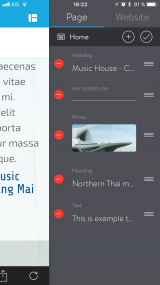 Jimdo for iOS also offers a lot few styling possibilities than the version for computers. 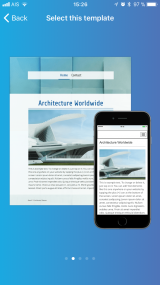 You can create pages and blog posts and populate them with headings, images, text blocks and photo galleries. You can manage some aspects of an online store. The most important improvements made since the version we reviewed 3 years ago is that you can now add sidebar content, which means that you can meaningfully edit the multi-column themes. You can also now add social media share buttons and other buttons, and you can add background images to pages. Text editing has been improved and now offers lists and indentation. 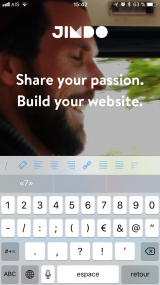 You can re-order and edit any of the content you create from within the app. 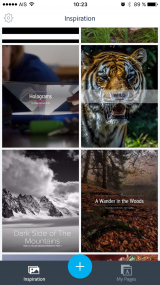 The image editor is probably the best of any of the apps I tested, and providing automatic resizing on upload, crop and rotate, image enhancements such as filters, overlays and frames. You can't create product pages or edit your existing products. You can't add any of the dozens of widgets (except the basic ones mentioned above), such as contact forms, the disqus comment system, calendars, flickr, Soundcloud etc. You can't edit your meta tags for SEO purposes or access security features such as password protected pages. You lose a lot of the styling and formatting options for text and blocks that are available in the computer browser version. You can't customise html or css in general (although this is not really a concern for most non-technical website builder users). Jimdo templates are beautifully designed. The choice of palette for each theme is also generally good and this basic element of the theme style can be changed within the iOS app. Some themes, however, seem to be less responsive than others. For example, the content might look good on small screens but not on larger screens. Websites made with Jimdo app have big fonts, which look too big on computers. 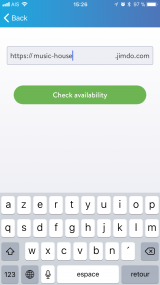 The app itself is available in English, Dutch, French, German, Italian, Japanese and Spanish. 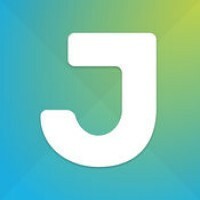 Multi language sites can be made with Jimdo for computers, but can neither be created or edited with the iOS app. Jimdo is available on all 3 major platforms, the only drawback is that the full capabilities are only available for the computer versions. The app is best considered as an assistant to the computer browser based website builder. Jimdo app has a sleek design and is easy to use. If you like to swipe right and left you can open the side menus this way. The same menus can be accessed by buttons in the top corners. 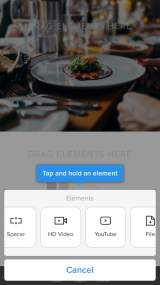 The number of options in each menu is quite limited which makes the app easy to learn. Jimdo Creator for iOS is a useful assistant to Jimdo for computers, but the limitations of the app mean that you will almost certainly have to use Jimdo on a computer to make your website truly work for you. The diversity of contents you can put on your website is average and certainly limited compare to the desktop browser version of Jimdo Creator. There are tricks to overcome some of the limitations (see the one above on inserting video), but these are just workarounds for missing features. If you edit your website on an Android device or a computer, you won't "break" anything. For example, you can insert a YouTube video from your Android device or computer, and then view it from you iPhone Jimdo app (the video player is difficult to stop actually). A blog editor is integrated into the app, so Jimdo is definitely a good platform if you need both a website and a blog. On paid plans, you can track the performance of your website, either with in-app statistics (page views and visitors line charts) or with Google Analytics. In the Support Center, Jimdo provides many insights on how to build a good website, but most of them take for granted that you are editing your website on a computer and do not take into account the limitations of the iOS app. Jimdo also posts regular articles on an informative blog, and you can also subscribe to their newsletter. Jimdo's blog could really help you bring your skills up to the next level. Jimdo-generated websites can look nice on mobile devices and computers but not all themes are equally good on both devices. Some themes have awkward font sizes which can only be adjusted in Jimdo for computers. Published websites load very fast. Jimdo have also done a good job of explaining SEO and how to create content that will work for people and for search engines. Having said this, very little can be done in Jimdo's iOS app. Metadata for social networks are automatically extracted from the start of pages, so you'll need to write good introductions. You'll also need to use Jimdo for computers to edit the more important description meta tags. If you need both a blog and a basic website, plan to promote them on Facebook, Twitter, etc., Jimdo Creator isn't a bad choice, and you might complete your site. On the other hand, if you need a more professional website and plan to make it visible on Google, Jimdo's app can't finish the job. You will have to go to the computer version. If there was no such thing as Jimdo for computers we might conclude that Jimdo's iOS app is nicely designed and easy to use, but offers limited website creation possibilities. Given that there is Jimdo for desktop... Jimdo say that you can create a website from scratch and edit existing websites from the app, and that to access the many advanced features of Jimdo, you just need to go to a computer browser now and then. I feel that this is a little disingenuous, that very few people will ever be able to complete their website using just the app, and those who do will have a sub-par website in some important respects. 5 years ago I wondered if the Jimdo app of that time had been made for marketing purposes, to point to their browser based website builder. 2 years later I argued that they had made a start on a real app, and that if they could integrate its features better with the themes and the desktop version it had potential, but that I still felt it was a marketing tool. Today, 3 more years later, there have been several improvements, but not enough to make me think that Jimdo ever intend to make their iOS app into a standalone website site builder. 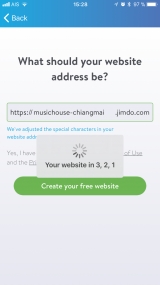 The chance of completing a site using Jimdo on a computer together with the app would be much higher than our 2 star rating, but as we're reviewing website builder apps, the 2 stars above are for the chances of completing a website using just the app.